Wouldn't life be easier if you didn't have to hunt for your favorite TV shows on multiple BitTorrent sites? Is it possible to have them automatically downloaded for your viewing pleasure? As it turns out, the answer to both is "yes". Just have ted do it. ted stands for Torrent Episode Downloader, and it combines RSS feeds and BitTorrent to make automatic downloading of TV shows possible. ted comes with an extensive predefined list of torrents for shows like 24, Battlestar Galactica, Heroes and Lost. Each episodes of these series can be downloaded directly from ted. You don't need to hunt for them yourself. You can tell ted to check for new episodes of these shows at regular intervals, and it will automatically launch your BitTorrent client to download them. ted isn't a BitTorrent client itself. 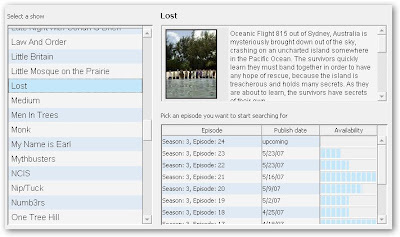 The program shows you the availability of each torrent and also provides helpful show descriptions. To add a custom show, you'll need to provide an RSS feed for ted to monitor, but with about 100 of the most popular shows that are airing already supported by ted, that probably won't be necessary.